The latest edition of LMD notes that the LMD-Nielsen Business Confidence Index (BCI) declined to 90 in December, following a jump of 25 basis points from 85 to 110 in the previous month. According to the leading business magazine, the results of the latest survey – which was conducted in the first week of December – can be attributed to factors such as the depreciation of the Sri Lankan Rupee, downgrading of Sri Lanka’s credit ratings by rating agencies and uncertainty that prevailed in Parliament at the time. 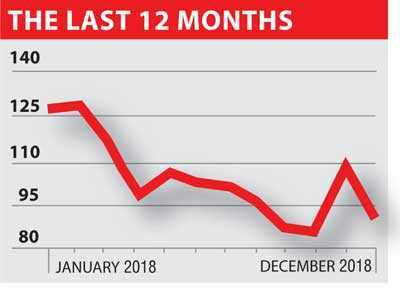 Nielsen’s Managing Director Sharang Pant observes that while the country’s macroeconomic performance has been somewhat encouraging in recent months, “political instability is outweighing the positives amid question marks hanging over investments by local and foreign investors”. Politics, the health of the economy, and bribery and corruption are reported as being among the main concerns in corporate circles. LMD’s publisher, Media Services, says the latest edition of the magazine will be released to leading bookstores and supermarkets on 4 January (for the full BCI report, visit www.LMD.lk).